Hatters boss John Still has demanded his side go all out to win their crucial League Two clash at Southend United. Town go into the game level on points with seventh-placed Plymouth Argyle and four behind Stevenage with just two matches remaining. A point would see Luton’s play-off hopes remain alive going into the last day, but Still said: “We’ll play to win. If at the end of the day you get a point, and it’s a useful point, that’s great, but we’ve got to go and try and win. “We could have set out with 10 men to get a point at Dagenham and we played with two forwards, the team always wants to win. “If we got a point, I wouldn’t moan about that, but we’re not going to play for a point. It’s important we go and try to attack, we’re best when we do that, we’ll go to attack, I think they’ll try to attack too. “To get to this stage still with an interest, with what’s gone on this season is a massive credit to the players dragging themselves kicking and screaming to find a couple of results and some good performances in the last few weeks. With Plymouth hosting rock bottom Tranmere at the weekend, while Stevenage entertain Carlisle, Still admitted he would be kept in the loop by goings on elsewhere. The boss continued: “I’ll know obviously and to a certain extent it can help you if hypothetically if a team right close to you is 3-0 down. “Then you’d think a point is a fantastic result, but you set up your team and it’s difficult half way through to change your mentality. “For us we would just like the opportunity to go into the last game of the season knowing that it’s possible, whether it’s in our hands or not we don’t know, if it’s possible, we’d be delighted with that. Southend themselves have plenty to play for too as their tremendous midweek win at Bury sees them level with third-placed Wycombe Wanderers, but behind on goal difference. On whether victory at the Shakers could work in Town’s favour as like Luton, Phil Brown’s side are desperate for victory, Still said: “I don’t know, I really don’t. “It’s funny how we all see things a bit different. Will they say, don’t throw caution to the wind? “I don’t know, but I think both teams will go to win, really push to win. 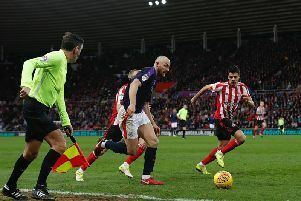 The Shrimpers go into the game on the back of a magnificent defensive record, as they haven’t conceded in their last seven games, winning six of them. Still wasn’t overly worried though, adding: “If we’re at our best as we were earlier in the season we’re a tough nut to crack as well. “When we’re right and proper and if our formation of the centre halves and (Nathan) Doyle is right, we’re tough to beat. “The last few games our defensive organisation has looked a bit more like it as well, so I think we can defend okay.